The renowned name in the premium compact SUV segment, Hyundai Tucson, is coming back to India after a long gap of 10 years. Let’s have a look at the 2016 Hyundai Tucson review and find out what this much-awaited South Korean drive has in store for the prospective customers. The third-generation Hyundai Tucson is finally arriving on the Indian soil after keeping its prospective customers on the wait for a long time. Previewed at the 2016 Delhi Auto Expo for Indian automobile market, the 2016 Hyundai Tucson review looks quite interesting in the neighbouring countries. Though the South Korean company has not revealed the official launch date for this India-bound compact SUV, but, according to sources the D-Day may be by the end of this year. The company initially launched this stylish drive in the year 2005 and that was when India also received it, but probably the manufacturer did not receive the expected ‘warmth’ for its latest creation and discontinued it in over a year. Arriving with a dynamic styling and sporty cabin, this Hyundai car houses power packed 2.0-litre engines under its striking bonnet. A wide range of safety aspects completes this compact SUV making it absolutely safe to be driven on varied terrains. The South Korean manufacturer is relaunching its premium SUV in the Indian market and is quite cautious with the price. Till date, 2016 Hyundai Tucson price has not been officially announced but it might fall between 16.0 to 20.0 lakhs (ex-showroom Delhi) across the variants. If this car arrives at the estimated prices, it can bring sweat on the faces of its rivals. The soon-to-arrive Hyundai Tucson was powered by a 1.4-litre turbocharged petrol power unit when it was showcased at the 2016 Delhi Auto Expo which is less likely to be used in the production model. Tucson is more likely to house a Nu 2.0-litre MPI and R 2.0-litre CDRi e-VGT engine which is available in neighboring countries. These engines are well tested and are found to be up to the mark with cent percent customer satisfaction. The Nu 2.0-litre MPI engine is capable of knocking out 155 PS of peak power at 6200 rpm along with 192 Nm of peak torque at 4000 rpm. The other engine, R 2.0-litre CDRi e-VGT is indeed more powerful with 185 PS of maximum power at 4000 rpm and 402 Nm of maximum torque between 1750 and 2750 rpm. The MPI engine comes mated with an option of 6-speed manual and 6-speed H-Matic gearbox while the CDRi power-unit will have the 6-speed H-Matic gearshift only. Coming to the performance part, the petrol unit delivers a fuel economy worth 11.4 kmpl while the diesel one has a record of delivering a mileage of 11.6 kmpl in standard conditions. The manufacturer has appointed McPherson strut type front suspension while the rear has multi-link rear suspension which coordinates well and ensure jerk and jolt-free drives even if you take this compact SUV on rough terrains. The third-generation Hyundai Tucson has been designed with a wide array of features. In comparison to the earlier generations, the upcoming Tucson will feature the Hyundai’s newest and highly talked about Fluidic Sculpture 2.0 design language which is also featured in the Hyundai Accent. This dynamic exterior styling gives an impression of constant motion even when it is in a stationary position. The new Tucson is full of curves and creases which accentuate its sportiness and beauty. If the President and chief design officer Peter Schreyer for Hyundai Motors is to be believed, this upcoming SUV represents the future of automobile industry with its heavily sculpted silhouette. 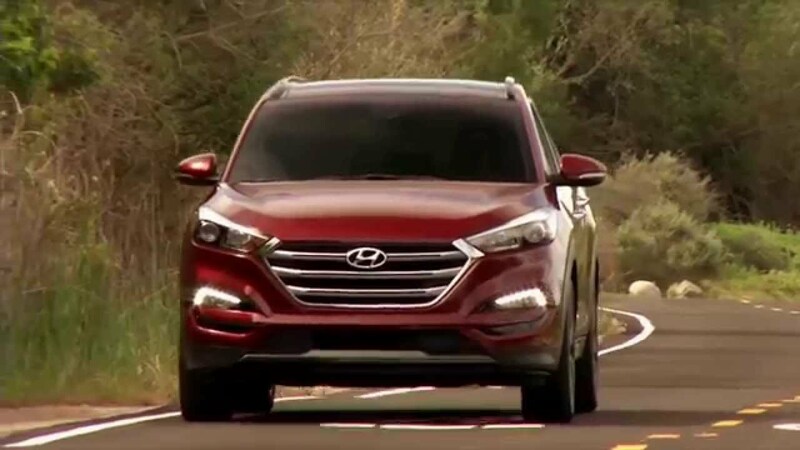 The dropping roofline rather gives an impression of sports coupe to the 2016 Tucson than Sports Utility Vehicle. 2016 Hyundai Tucson features a heavy chrome embellished hexagonal grille with a pair of stylish headlamps which gives it a bold front fascia. The side profile is equally distinctive with canted-forward fenders housing 18-inch alloy wheels with complementing 225/55 R18 tires for absolute stability during those sporty adventurous drives. The rear has been given equal importance, unlike other cars. Tucson’s rear somehow has a close resemblance with that of Santa Fe but surely that’s not a complaint. The tail lamps have been stretched to the tailgate adding more sportiness and appeal. The 5-seater compact SUV is expected to measure 4475 mm x 1850 mm x 1660 mm (L X W X H) along with a wheelbase of 2670 mm which sounds pretty sufficient to house 5 passengers with great comfort. The minimum ground clearance of 172 mm will allow this compact SUV to run on varied terrains including hilly ones. Sliding inside the cabin of new Hyundai Tucson, it doesn’t look that exceptional as its exterior but there is no compromise on the comfort and convenience front. 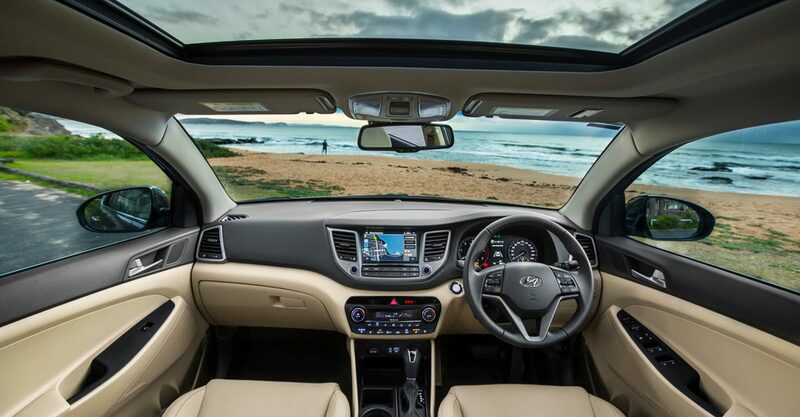 The new Hyundai compact SUV ensures the best of comfort for 5 passengers with great legroom and headroom, even if all of them are above average in height and heavier on weighing scale. Though the traditional layout may disappoint initially, but keeping other aspects in mind, that fact can be overlooked. The soft material on seats and interior trim adds premiumness to the entire cabin. There are numerous new-age aspects in this car which attract the young generation, including the smart-powered tailgate which opens when someone waves foot under it. This way you can open the tailgate even if both your hands are occupied. The chrome accents on steering, entertainment facility and dash gives it an upper class feel while the intelligently designed dashboard features all the necessary gauges and switches without making it look overcrowded. The neat cabin layout of this drive is surely the most attractive feature while you may find the boot area to be its best utility feature. The standard boot counts around 488-litre with the facility of enhancing it by split folding the 3rd row seats to flat. Some petty cabin storage in form of cup holders and glove box are also given to pack handy stuff. 2016 Hyundai Tucson features a wide range of comforting and convenient aspects which can make the traveling so much fun, entertaining and easy. The occupants get to enjoy the privilege of air conditioner, power steering and engine start/stop button. The powered tailgate with gesture recognition feature makes it convenient for the occupant to open it without touching. A panoramic tilt and slide sunroof is also there so that the passengers may enjoy gazing the endless sky and fresh air. The driver seat comes with 8-way power adjustable facility and lumbar support while the front passenger seat has 6-way power adjustable facility. 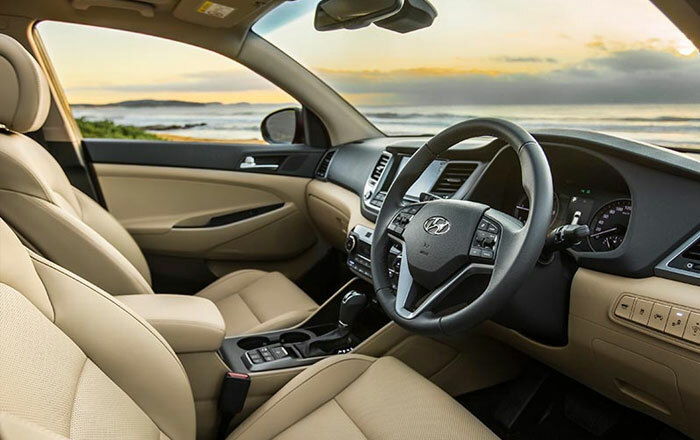 With all these aspects, the 2016 Hyundai Tucson also features an advanced infotainment facility which is expected to comprise an 8-inch touch display, Bluetooth, AUX, USB connectivity and MP3. The Seoul-based auto manufacturer is quite serious about the safety of the occupants in its fleet. To ensure the same, it packs features which can practically help the occupants in crucial times. 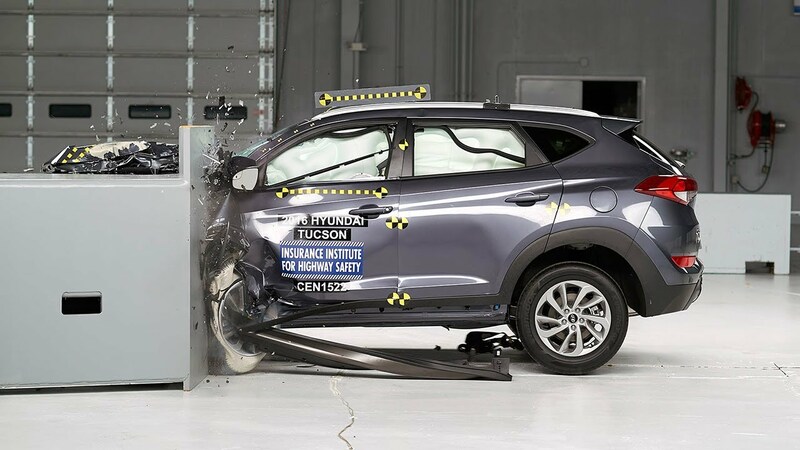 The 2016 Hyundai Tucson is no exception and houses advanced features like lane keep assist, blind spot assist system and autonomous emergency braking. Other features which are expected to be a part of this safety package are dual front and side airbags, central locking system, parking sensors with rear camera and seat belt warning alarm. Since this compact SUV is meant to be taken on varied terrains, there are Anti-Lock Braking System (ABS) and Traction Control to ensure stability and complete control. The closest rival for 2016 Hyundai Tucson in the Indian market is Honda CR-V. However, Mahindra XUV500 may also feel a bit threatened with the arrival of the new Hyundai compact SUV. Loaded with aspects and wrapped with a style-statement of its own, this drive can bring fear in the minds of big guns like Toyota and Ford for their Fortuner and Endeavour respectively. Positioned between Hyundai Creta and Hyundai Santa Fe, the South Korean brand has tried to make a comeback in the premium compact SUV segment in India through its 2016 Hyundai Tucson. Surely, there are numerous features which can convince any prospective customer to turn the enquiry into a deal. If the estimated 2016 Hyundai Tucson price falls to be the same as mentioned in the price section then new Hyundai Tucson can be a great drive for someone who loves a comfortable and power packed drive wrapped with advanced safety aspects.